"He needs to be euthanized," Brooks announced upon meeting Jupiter. 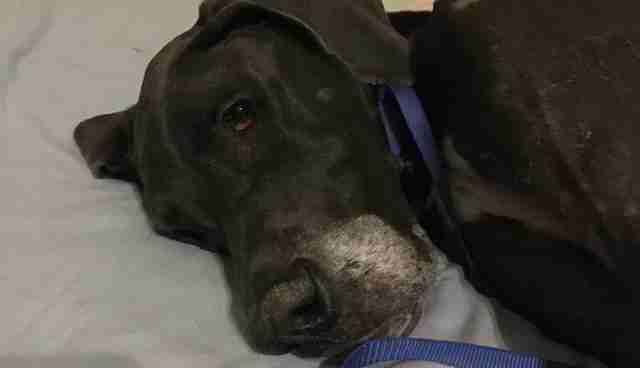 At least 30 pounds underweight and suffering from severe allergies, the dog was a portrait of despair when Brooks took him home from the shelter. Indeed, it looked like someone gave up on Jupiter long before he was dumped at a shelter in California City, California. "All of the itching and scratching has caused secondary skin infections all throughout his body," Brooks told The Dodo. "His stomach is pink and raw. There are bald, rough patches all over his entire body." It seemed like Jupiter had also given up on himself. "He is there, but there's not much to him, spirit-wise," she said. More accurately, she saw a dog on borrowed time. "We thought maybe he had bone cancer," Brooks said. "He could barely walk, he was very wobbly." So she lent him her compassion. A specialist at VCA Animal Hospital West in the area even offered to stay well beyond his shift to treat Jupiter. No one was particularly optimistic. 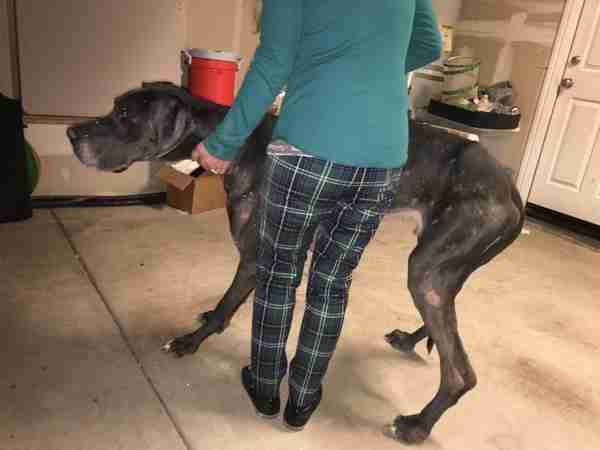 "We loaded him into one of our volunteer's cars and took him to the emergency vet right away, assuming they would say he would need to be put out of his misery," Brooks said. Jupiter's sorry saga would soon reveal another heartbreaking twist. An initial X-ray found a screw lodged inside Jupiter's stomach - potentially deadly if, like some, the screw contained zinc. At the very least, the errant object could cause untold carnage to Jupiter's digestive tract. But a subsequent probe found no sign of the screw, suggesting it might have tumbled into his intestines. Somewhere along the way, however, the group found Jupiter's spirit, which apparently hadn't completely checked out. Brooks says Jupiter is friendly with humans and other dogs. And, most importantly, he's now in stable condition. Today, all eyes are on his bathroom breaks. "Luckily it is a small screw and he is a big dog," Brooks said. Unluckily, a small screw isn't the easiest thing to find in a heap of Great Dane droppings. "For now it is a wait, watch and see," Brooks says. "We're on poop control now." It took too long for Jupiter to find the love he needed. But he's finally in the right hands. 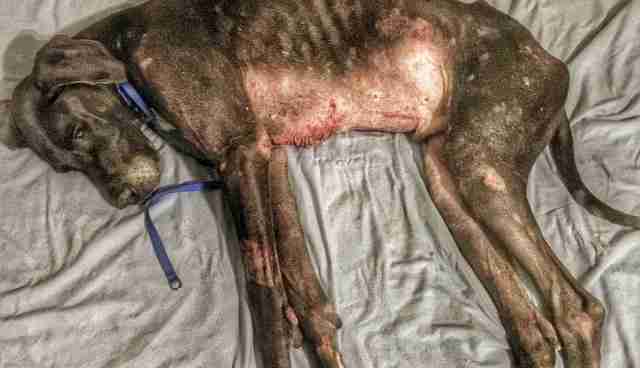 You can help give him the medical attention he needs by making a donation here. It may be months before Jupiter is available for adoption, but you can get updates on his condition by following Marley's Mutts on Facebook.